Download CG Vyapam DEO Assistant Previous Papers PDF Files are provided on this page in pdf format. Therefore, download the Chhattisgarh CGPEB Assistant Grade 3 Steno Old Year Question Papers PDF Files here. Also, see the official website of CG Vyapam for further more details of the Assistant Grade III Exam i.e. www.cgvyapam.gov.in. Visit our home page of www.previouspapers.co.in. The individuals who had applied for this recruitment are surfing for CGPEB Solved Question Papers. Those candidates can get the CG Vyapam Previous Years Question Papers of Data Entry Operator Exam from our website. You can also get the CG Vyapam DEO Sample Papers along with the solutions at free of cost. We are providing the Chhattisgarh Vyapam Steno Asst Grade III Exam Solved Question Papers to give proper direction for the individuals who are preparing for the DEO exam. These CG Vyapam Shorthand Typist DEO Old Year Question Papers are very helpful to the aspirants while preparing for the written exam. 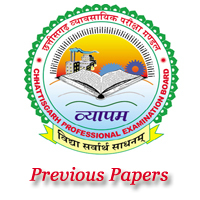 Hence, the candidates can download these Chhattisgarh Professional Examination Board Data Entry Operator Model Question Papers pdf files from the attachments available below. Use these CG Vyapam Assistant Grade 3 Last 5 Years Old Question Papers as a source for the preparation. The Chhattisgarh Vyapam Professional Examination Board has recently announced a CG Vyapam DEO Recruitment Notification 2017. It is for filling the 18 vacant posts of DEO, Grade III Assistant & various posts. A tremendous number of candidates are waiting for the Chhattisgarh Government Jobs. Therefore, those people can apply for this Recruitment notification released under the CG PEB Vyapam. The interested aspirants can apply online for this Chhattisgarh PEB Recruitment Notification 2017. Before that, check the eligibility details. You can find that details on the Official Website and check the official notification. The official website of CG Vyapam PEB is www.cgvyapam.gov.in or www.cgvypam.choice.gov.in. Individuals can refer the Official Notification for age limits, selection process, educational qualification, and so on. The perfect preparation will surely help the applied candidates to crack the Written Test. Hence, download and use this CG Vyapam DEO Assistant Previous Papers PDF for better preparation tips. Check the exam pattern of the CG PEB Vyapam Steno Grade 3 Exam in the below table. Total marks for this DEO exam is 200 marks. The exam duration of this Assistant Grade III exam is 3 Hours i. 180 Minutes. An immense number of aspirants who had applied for this CG Vyapam Jobs are surfing the internet for Previous Papers along with preparation tips and materials. Hence, for the sake of these surfers. Here www.previouspapers is updating the precious information about CG Vyapam Exam, i.e., CGPEB Vyapam Previous Papers of all subjects that are present in the CG Vyapam DEO Exam Syllabus 2017. Download these CG Vyapam DEO Asst Old Question Papers along with the solutions. This Exam comprises of Objective Questions from the General Ability, Chhattisgarh General Knowledge, Mathematics, and other subjects. The Interested can get the CGPEB Vyapam Asst Gr 3 Model Papers PDF. Click to view the CG Vyapam DEO Assistant Previous Papers along with the answers. The contestants who are going to attend the CGPEB Vyapam Exam can visit this page for the important phase of preparation such as Syllabus and Exam Pattern. Therefore, CG Vyapam PEB Exam Syllabus and Test Pattern 2017 will help the participants to learn about the formation of the Written Exam Paper, pattern, subjects, and so on. So that the candidates can surely perform well in the CGVyapam Written Test Selection Process. So, Please check the links to get the complete material of the Chhattisgarh PEB Vyapam Recruitment Test. The Direct links to download the Chhattisgarh Vyapam Last 5 Years Question Papers are present below.